Magnificent yet magnificently daft news out of Switzerland: the Maserati Quattroporte is going racing. The four-door V8 supercar is preparing to hit the track in the Italian ‘Superstars Series' touring car championship, duking it out with Audi RS4s and BMW M5s. It'll be entered by Swiss race outfit ‘Swiss Team' (tricky to know how they came up with that name, really) and driven by former F1 driver Andrea Chiesa. 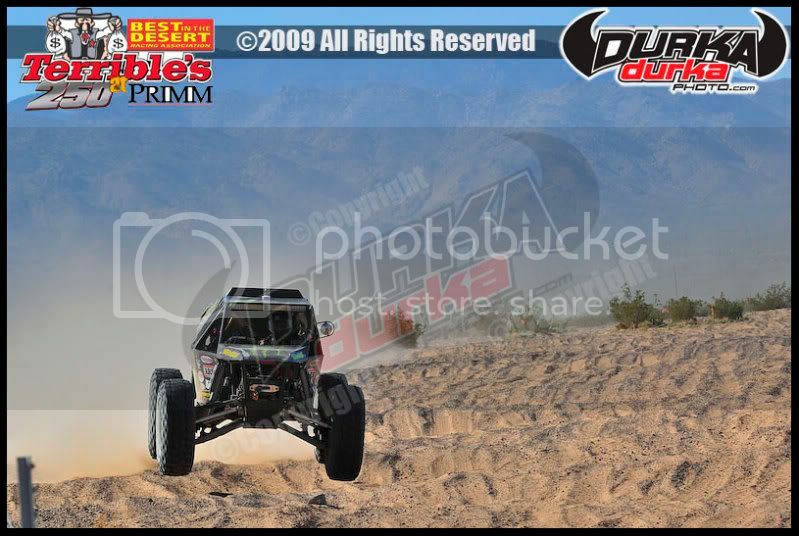 Lucas Oil Off Road Racing and UTV Aftermarket Giant Dragonfire Racing Bring UTV Racing to LOORRS! Corona, California (April 16, 2009) - The exciting, side by side, door banging action of UTV racing will make its Lucas Oil Off Road Racing Series debut in Surprise, Arizona on May 2nd and 3rd. Through an agreement finalized this week, the UTV Classes will be presented by UTV aftermarket industry leader Dragonfire Racing. This agreement will allow Pro UTV Racers to race for an attractive purse each weekend while contending for the Dragonfire UTV World Cup Trophy and year-end Championship Purse. "I'm excited to see UTVs in the huge arena of short course racing," stated President and Founder of Dragonfire Racing, Todd Romano. "This gives us a great opportunity to work with the teams that race while also reaching out to the UTV community that utilizes our products. 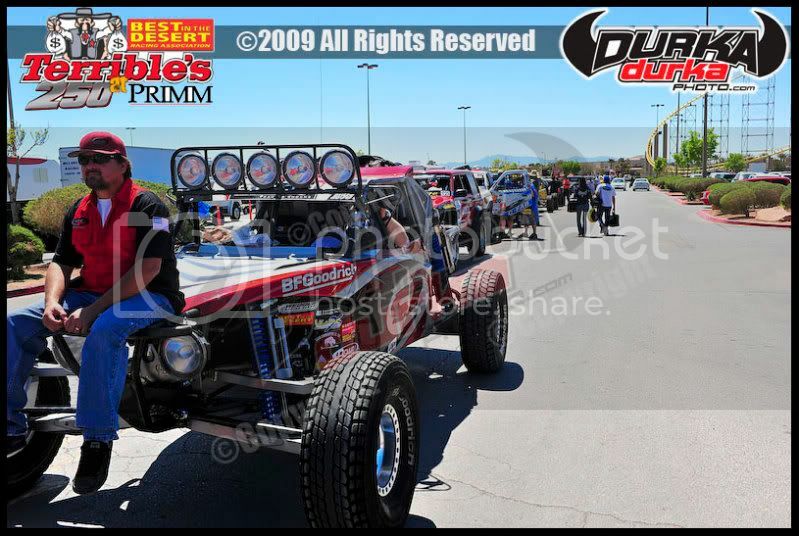 The Lucas Oil Off Road Racing Series provides a large venue to feature these vehicles. We're thrilled to be a part of it." 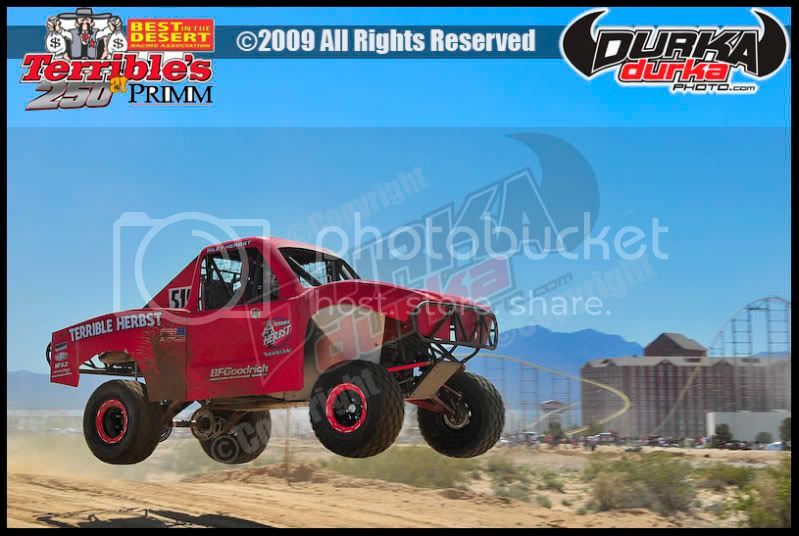 While their products are known and distributed globally, Dragonfire, based in Mesa, Arizona, looks to a be strong local marketing partner as the Lucas Oil Off Road Racing Series makes its first appearance in Arizona. Said Lucas Oil's Bob Patison,"We're pleased to have UTV Racing in the series and to be working with Todd Romano and his team. There seems to be no limit to the growth in the UTV market and through this partnership we will be able to bring UTV racing to our event program." 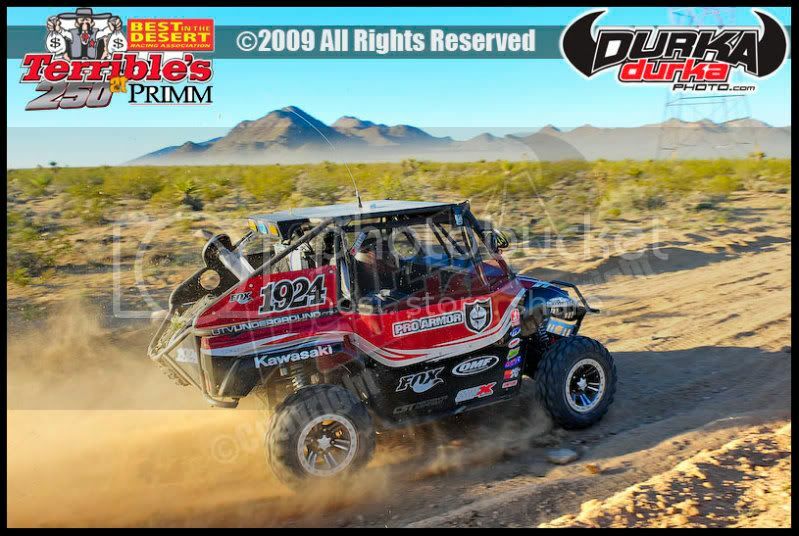 Regarding the possibility of television coverage for the UTV class, Patison continued, "These are closely matched vehicles with tight racing so there is a great opportunity to provide some fantastic exposure for UTV racing." Unlimited UTV - Heavily Modified UTV up to 800cc in displacement. 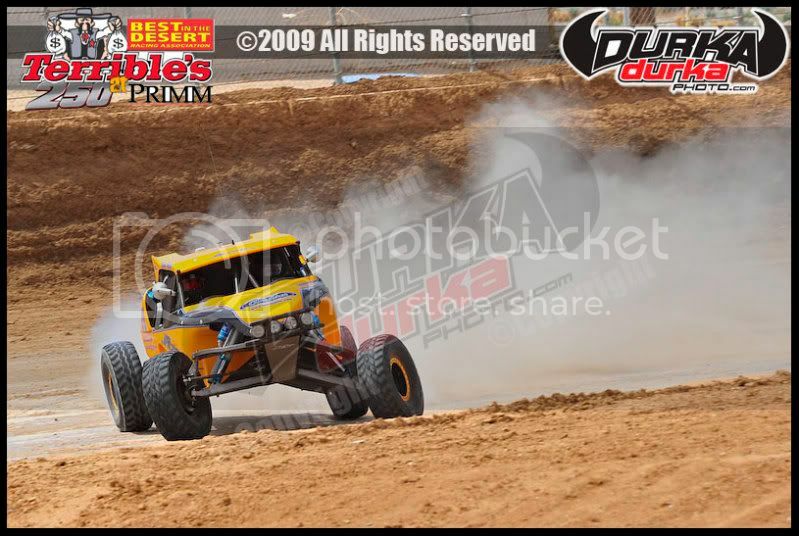 Modified UTV - Developmental Modified Class Utilizing up to 1000cc displacement. 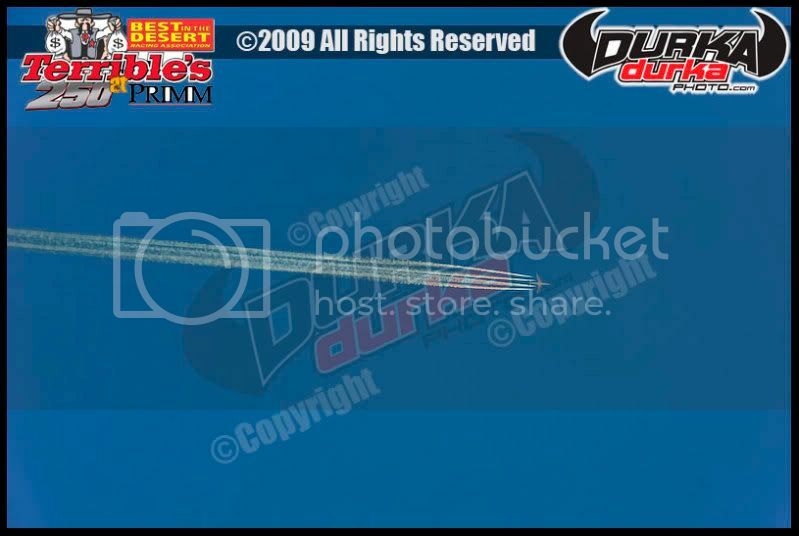 Prize package and merchandise presented by Dragonfire Racing. This is no science fiction tale from the 1983 movie, "Twilight Zone." No, unlike actor John Lithtgow, who played character John Valentine, haunted by what he thinks is a gremlin bent on causing the airliner he's flying in to crash, former Best In the Desert racing champion Randy Merritt is experiencing a real life battle with not one gremlin, but a few. And unlike Lithgow, who shoots at and misses his gremlin, Merritt has grabbed his gremlins by the throat and shown them who's the boss. And none too soon. 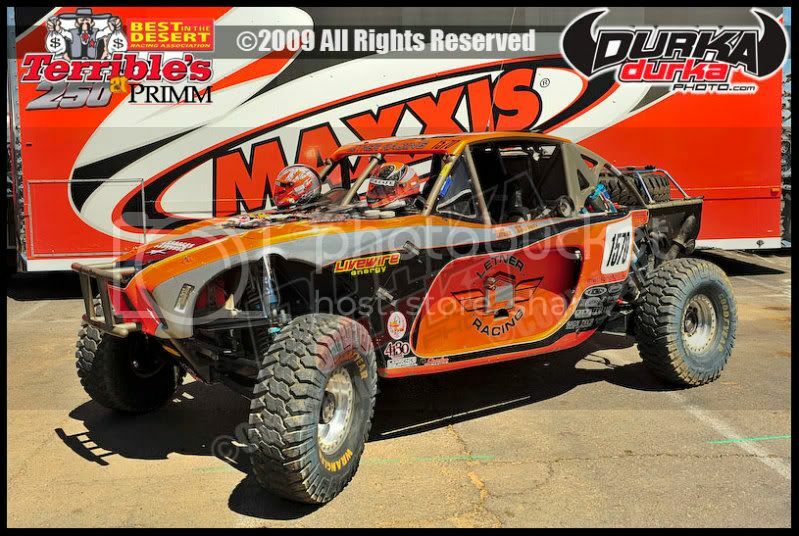 The Mongo Racing Team, out of Parker, Ariz., which captured the 2006 season championship in Class 8100, gets back into action April 16, 17, 18 and 19 in Primm, Nev., at the Best in the Desert Terrible's 250. "I feel good," said Merritt as he prepared his Mongo Racing Ford F-150 for the next race on the 2009 calendar. "It hasn't been fun for about the last year and a half. But with the changes we've made, I believe we've solved our problems, got rid of our gremlins. And I feel good about that." At the 2009 season-opening event, the Blue Water Casino Parker 425, right in Merritt's backyard, "we sucked," said the frustrated driver matter of factly. A steering problem relegated Merritt to a DNF at Parker. 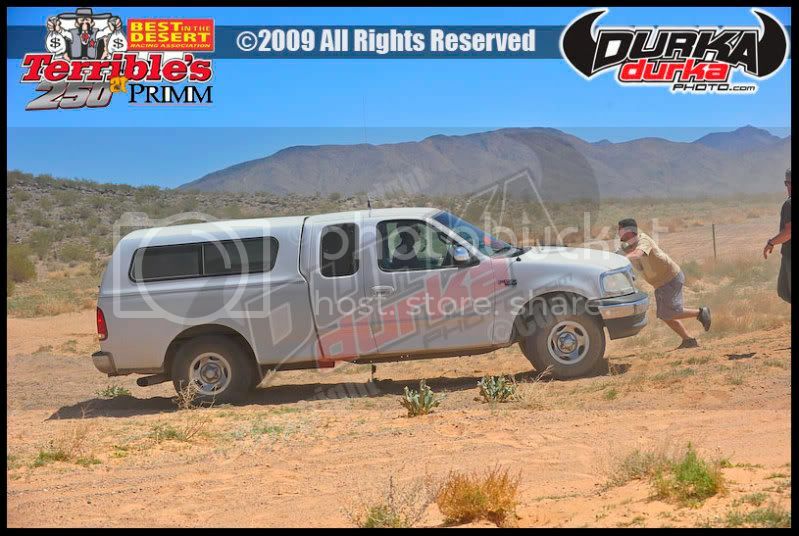 Prior to that, repeated transmission problems, specifically broken tailshaft housings, along with a twisted spline in the drive-line yoke have added up to more DNFs and headaches in 2007 and 2008 than Merritt cares to talk about. "Now, we're ready to put all of that behind us," said Merritt. "I believe we have our problems fixed." He's also excited about about having two new sponsors on board for the Terrible's 250 — Royal Purple Synthetic Oil Products, and Yukon Gear and Axle. "It's great to have these two new sponsors," said Merritt. And he's equally excited about using Goodyear's new MTR off-road tire. "Goodyear has stuck by us," said Merritt. "They are the best. They've always supplied us with some great tires, and I'm really looking forward to using these new MTRs. "We've been down for a while now, and nobody has heard much from Mongo Racing," said Merritt. "But I'm confident we are ready to start our climb back toward the top." Other Mongo Racing sponsors include KC HiLiTES, Ford Trucks, Sway-A-Way, Ump, Camburg Engineering, Autometer, Bodyline and Mongomade Grafix. Also, race fans can go to www.mongoracing.com on race day to see live satellite tracking and other Mongo Racing race information. rob mac headLas Vegas, Nevada - Rockstar Energy Racing's Rob MacCachren and his FORD Raptor teammate, Team Ford's Steve Olliges, are set to host NASCAR standout driver, Greg Biffle, and Monster Jam driver, Linsey Weenk, at this weekend's BITD Terrible's Town 250 held in Primm, Nevada. 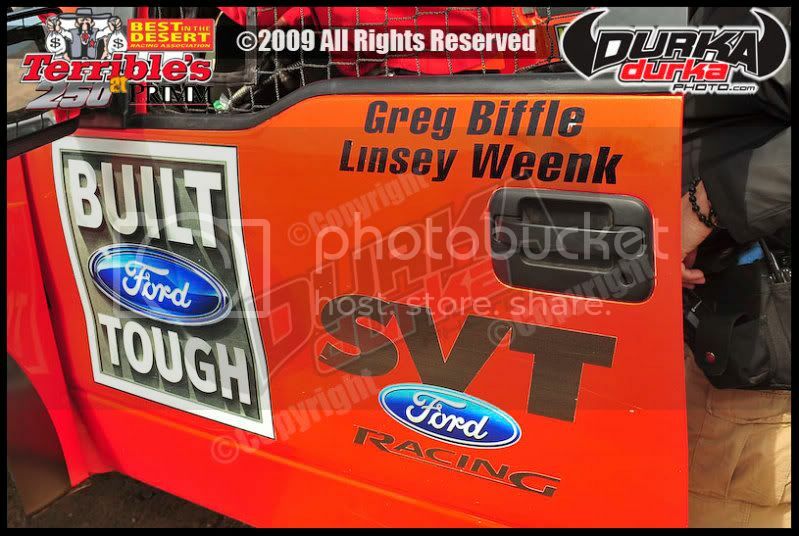 Greg Biffle will take time out of his busy NASCAR schedule to run the FORD Raptor race truck on Thursday afternoon before the BITD Terrible's Town 250 qualifying action kicks off. 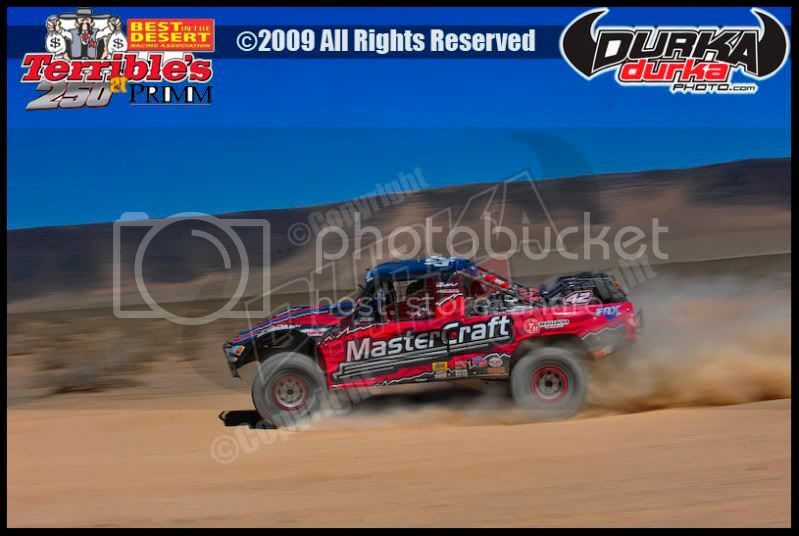 Monster Jam superstar, Linsey Weenk, will race the FORD Raptor race truck during Saturday's second race of the 2009 Best in the Desert 5-race series. Off road racing champion, MacCachren, will co-drive for Linsey Weenk during the race, as the Monster Jam racer is slated to drive one of three 69-mile laps. Weenk, from Alberta, Canada, who campaigns the Built Ford Tough Blue Thunder in Monster Jam will trade in his 10-minutes of Monster Jam racing for a full 69-miles of desert thunder in what has long been regarded as the most brutal race course in the Nevada desert. Olliges and MacCachren will split the other two laps as FORD debuts the first of a handful of FORD racing superstars that will be part of the 2009 FORD F-150 Raptor race program. Greg Biffle commented about the new Ford Raptor, "When I think of Raptor, the first thing that comes to mind is a proven off-road piece with its finish in the Baja 1000, and I think it's a long-time overdue, if you want my opinion. Up to this point, no manufacturer has built a truck like this. People had to do it themselves, so there's a definite market out there and I'm excited about it. I've been paying attention and watching some of the desert testing that they've done and I can't wait," said Biffle. The # 16 Jack Roush owned 3M Ford will race at the Phoenix International Raceway under the lights on Saturday night. MacCachren led the FORD F-150 Raptor race program to the podium, finishing second at the season opening race at the BITD Blue Water Parker 425. Battling against extreme elements of cold temperatures, freezing rain and deep pools of storm runoff, MacCachren charged the FORD F-150 Raptor through the black night with his KC HiLites claiming a podium spot in Class 8000. Energy Racing team takes place at Texas Motor Speedway under the lights on Friday, May 15, 2009, as The Off Road Championship (TORC) series kicks off their season. Rob MacCachren is sponsored by FORD, BFGoodrich Tires, FORD SVT, FOX RACING SHOX, Mastercraft Race Seats, KC HiLites, Nevada Buggy Supply and ROCKSTAR Energy Drink. ROCKSTAR is the world's most powerful energy drink. Enhanced with the potent herbal blends of Guarana, Ginkgo, Ginseng and Milk Thistle, ROCKSTAR is scientifically formulated to provide an incredible energy boost for those who lead active and exhaausting lifestyles-from athletes to rock stars. PARTY LIKE A ROCKSTAR! For over 30 years, Rob MacCachren has been racing in the open desert. 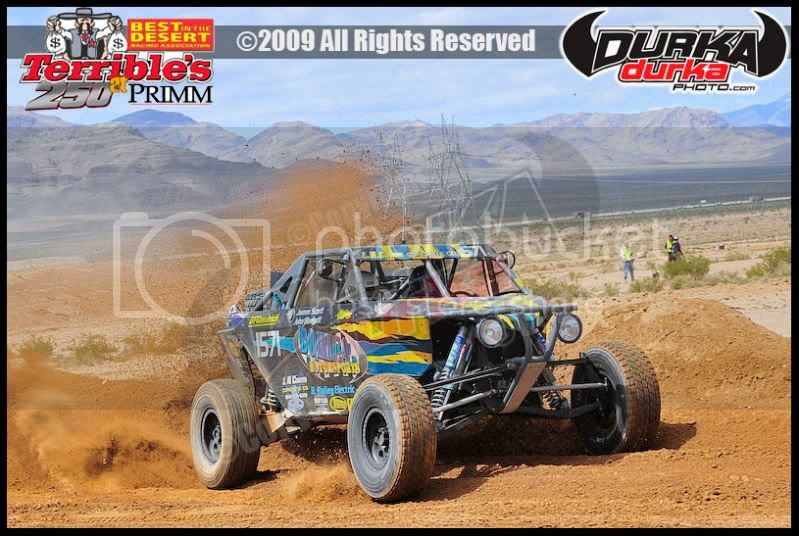 As a third generation desert racer, Rob began his career following in the footsteps of his father and grandfather while growing up in the Nevada desert. His career accomplishments include winning three Borg-Warner Champions in a row at the Crandon International Raceway, as well as winning the longest SCORE Baja 1000 ever held. 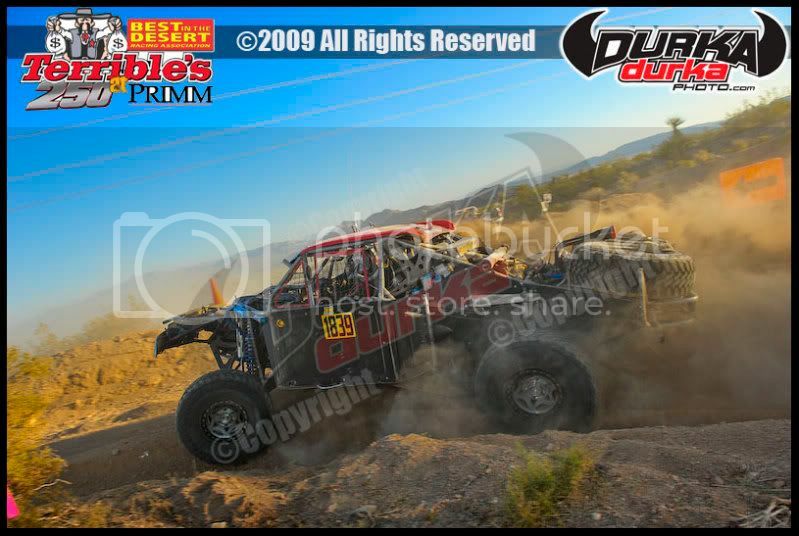 The multi-discipline racer has accumulated over 150 victories and numerous championships between closed short course and desert racing. CHARLOTTE – (April 14, 2009) – General Tire has partnered with Universal Pictures to become the official tire for the ultimate chapter of the franchise built on speed – “Fast & Furious.” In this latest installment that broke records at last weekend’s box office, Vin Diesel and Paul Walker head back to the streets where it all began. They rejoin Michelle Rodriguez and Jordana Brewster to blast muscle, tuner and exotic cars across Los Angeles and floor through the Mexican desert in the new high-octane action-thriller. General Tire has outfitted the main vehicles in the movie with its Exclaim UHP tires. General Tire is backing up its involvement with the film with a special promotion. From March 30-May 25, 2009, consumers who purchase four General Tires will receive a free $50 gift card. In addition to the gift card, consumers can enter the “Fast & Furious” Sweepstakes. The Grand Prize is a 2009 Subaru STI or $10,000 cash; First Prize is a custom Fast and Furious Gibson guitar. No purchase is necessary for the sweepstakes. Visit www.generaltire.com to enter, or text GENERAL to 834567. The company is backing the promotion and sweepstakes with a variety of dealer point-of-sale materials, as well as an advertising campaign in a variety of automotive enthusiast publications. Truly a performance tire for all seasons, General Tire's Exclaim UHP delivers unbeatable performance. Developed for sports cars, coupes and sedans, Exclaim UHP is designed to provide extraordinary handling, traction and control -- even on rain-soaked roads. When a crime brings them back to L.A., fugitive ex-con Dom Toretto (Diesel) reignites his feud with agent Brian O’Conner (Walker). But as they are forced to confront a shared enemy, Dom and Brian must give in to an uncertain new trust if they hope to outmaneuver him. And from convoy heists to precision tunnel crawls across international lines, two men will find the best way to get revenge: push the limits of what’s possible behind the wheel. LOS ANGELES—Following his dominating season-opening victory at January’s 15th SCORE Laughlin Desert Challenge and a solid runner-up finish at March’s 22nd Tecate SCORE San Felipe 250, NASCAR Cup owner/driver Robby Gordon has kept himself at the top of a very crowded Overall leaderboard in the 2009 SCORE Desert Series point standings. With 125 points, Gordon, 40, who returns to his desert racing roots often, also leads the marquee SCORE Trophy-Truck class for high-tech, 800-horsepower, unlimited production trucks in his No. 77 Team Gordon Chevy CK1500. With just 27 points separating the top 20 in 2009 SCORE Overall points, SCORE racers are now preparing for the 41st Annual Tecate SCORE Baja 500, to be held in Ensenada, Mexico, June 5-7. The computerized drawing for starting positions, by class, for Round 3 of the World’s Foremost Desert Racing Series will be held at the SCORE headquarters in Los Angeles on Saturday, April 25. Wilson Motorsports of Long Beach, Calif., currently leads two classes as well as being second and third in SCORE overall points after two races. 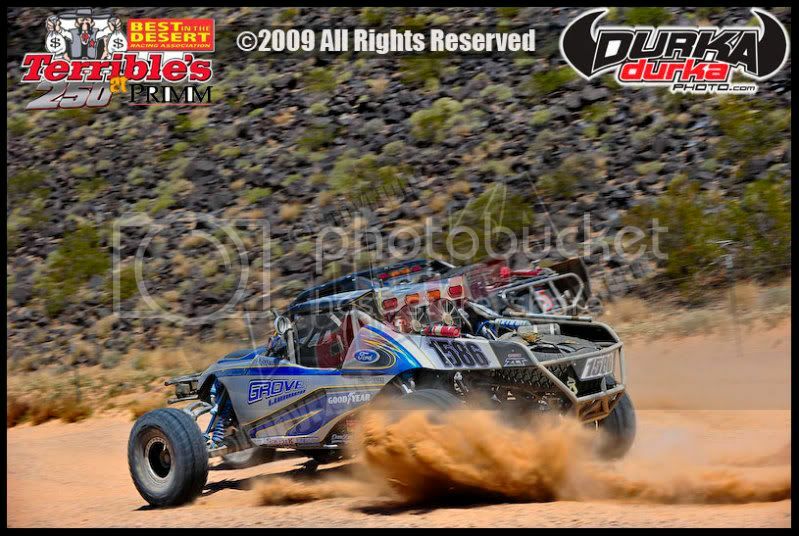 With two Class 1 open-wheel desert race cars and two Class 1-2/1600 open-wheel cars with 1600cc VW engines, Ronny Wilson, 46, the youngest of the three Wilson brothers, leads Class 1 and is second overall with 116 points while tied for the lead in Class 1-2/1600 and tied for third in overall points with 114 is Brian Wilson, 23, Ronny’s nephew and son of Rick Wilson, 52, the oldest of the three Wilson brothers. Brian Wilson is tied with Justin Smith, Capistrano Beach, Calif., who drives a Fraley-VW. 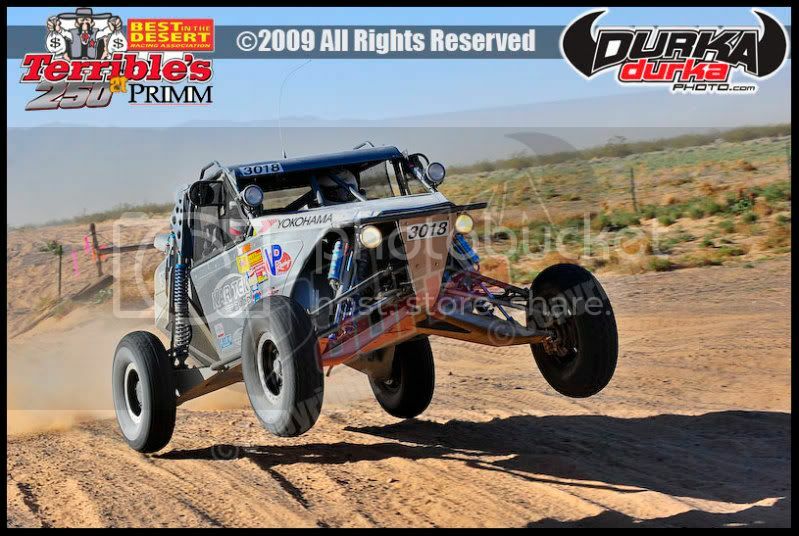 After a fourth place in Class 1 in Laughlin, Ronny Wilson drove his Chevy-powered Jimco to first place in San Felipe while finishing third overall. He leads his brother Randy Wilson, 50, by 13 points. Randy Wilson is 13th in overall points in another Jimco-Chevy. 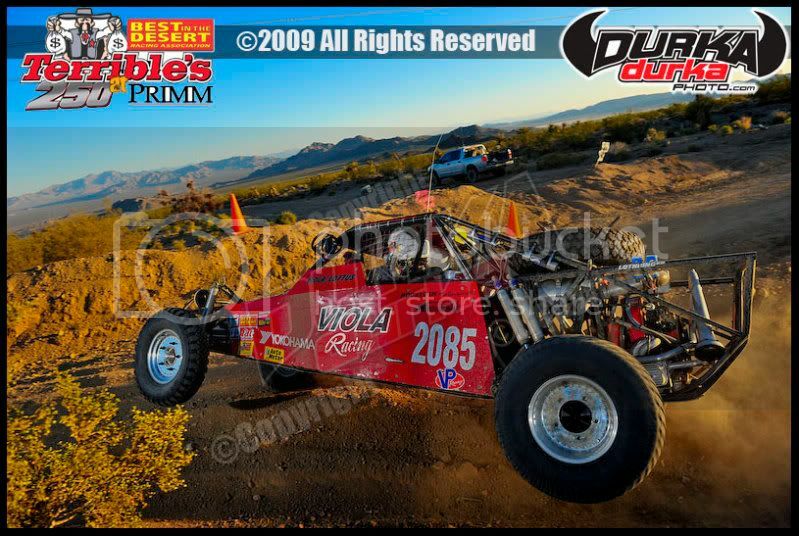 With a fourth place class finish in Laughlin, followed by a second place in San Felipe in a Kreger-VW, Brian Wilson is a field superintendent for the family business-Norm Wilson & Sons, a prominent Southern California general contracting company. Wilson is receiving considerable help this season from veteran co-driver Sammy Ehbrenberg, Las Vegas, who splits the driving with Brian Wilson when not mentoring him in the sport. Rick St. John, Encinitas, Calif., has won both SCORE Lite races this season in a Duvel-VW with help from Class 1-2/1600 regular Adam Pfankuch, Carlsbad, Calif., to lead their class and rank fifth in the current overall point standings with 110. Pfankuch is currently eighth in Class 1-2/1600 points. SCORE points are based on starting and finishing as well as the number of starters in each class and placement position in every race. While the top five in the 2009 SCORE Overall point standings are just 15 points apart, the second five is even closer with one driver with 107 points and four with 105 each. After winning Class 10 in San Felipe in his Lothringer-VW, Mike Lawrence, Banning Calif., is leading the class he won the season championship in last year and stands sixth in SCORE overall points with 107. 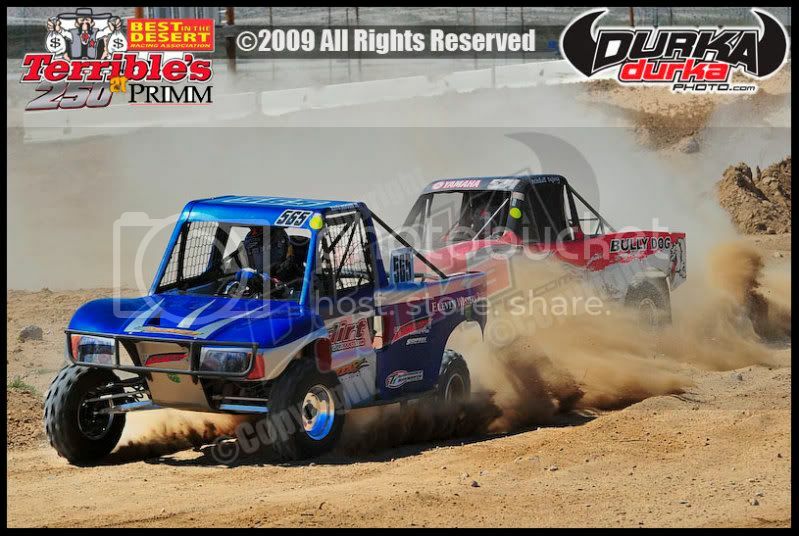 Carr, San Diego (Class 5, open VW Baja Bug) and Gavin Skilton, Anaheim, Calif. (Stock Mini, Honda Ridgeline). Eric Duran, Tecate, Calif., is driver of record for his family team and is third in Class 1-2/1600 in addition to being part of the four-way tie for seventh in SCORE overall points in a Neth-VW. 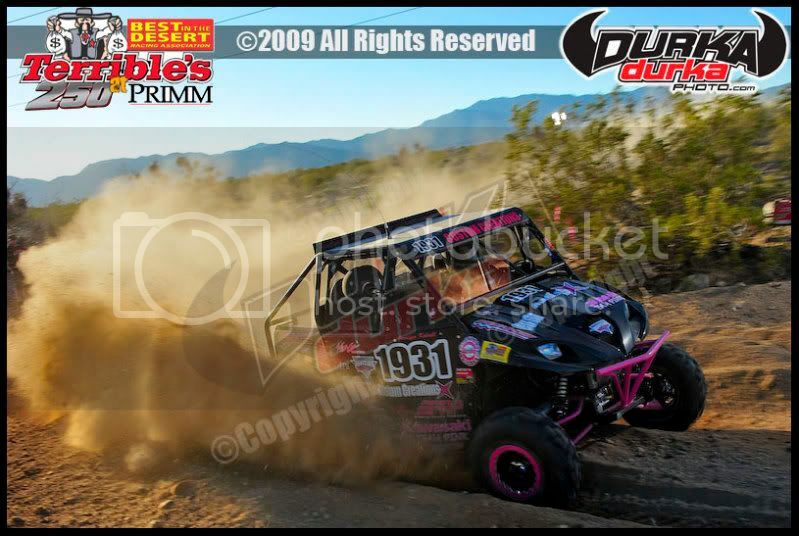 One of three female regular racers this season, Heidi Steele, San Clemente, Calif., leads the Class 6 points in the Desert Assassins Ford Ranger. 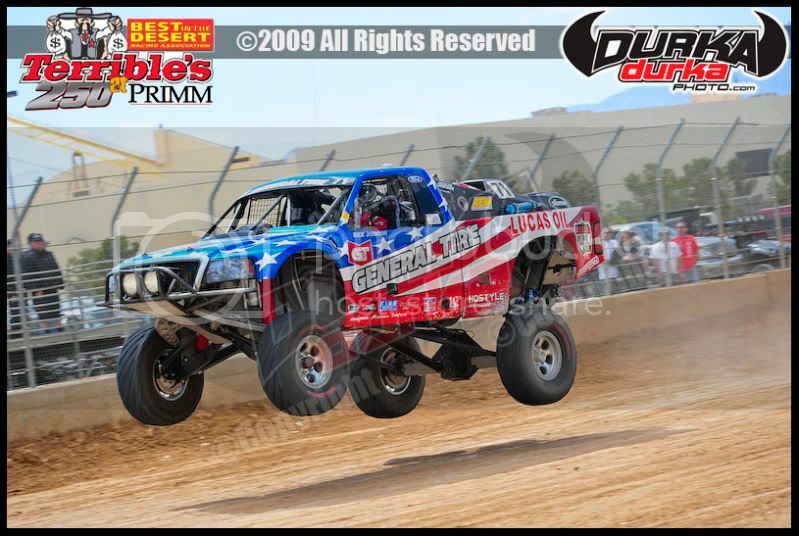 Steele’s husband Cameron Steele is ninth in SCORE Trophy-Truck points. Michelle Bruckmann, Lemon Grove, Calif., is third in SCORE Lite and Anna Cody, Simi Valley, Calif., and her all-female team, is second in the motorcycle Class 20 points. Heidi Steele’s season point title last year was in Class 7SX and this year she is driving in two classes and also stands in third place in Class 7 in another Desert Assassins Ford Ranger. 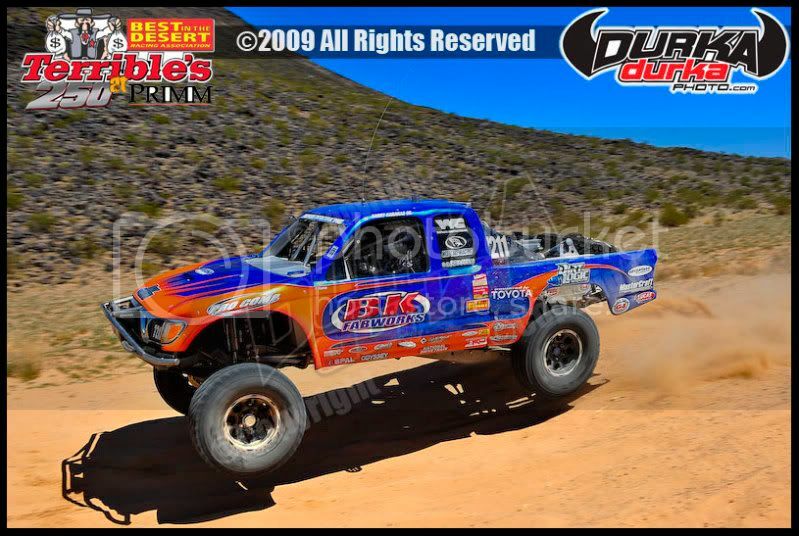 Among the car and truck classes, other point leaders include: Jose Canchola Jr., Mexicali, Mexico. 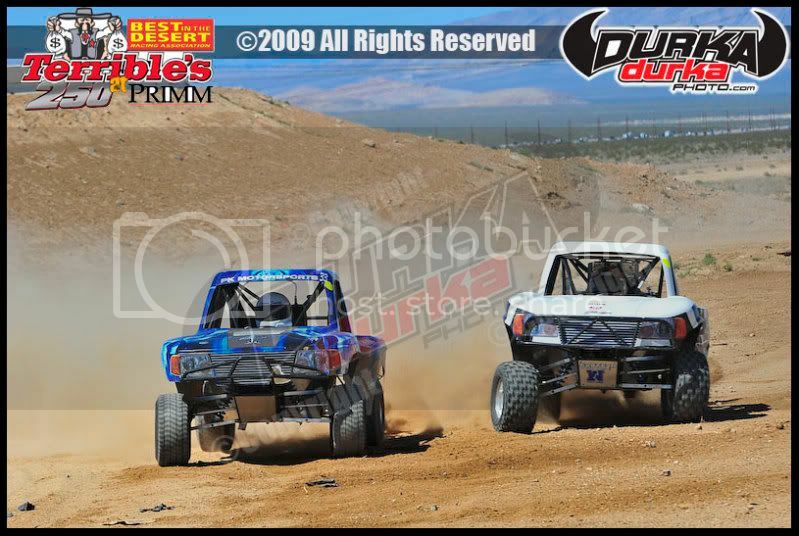 (Class 7, Ford Ranger), John Holmes, Olivenhain, Calif. (Class 7SX, Ford Ranger), Clyde Stacy, Bristol, Va.. (Class 8, Chevy Silverado), Alonso Angulo, Ensenada, Mexico (Class 5/1600, 1600cc VW Baja Bug) and Eric Solorzano, Tijuana, Mexico (Class 11, stock VW Sedan). With motorcycles and ATVs racing in the three SCORE Baja races, the team of Kendall Norman, Santa Barbara, Calif./Tim Weigand, Santa Clarita, Calif., leads the open motorcycle Class 22 standings with 68 points after the Tecate SCORE San Felipe 250 on the factory-supported No. 1x Johnny Campbell Racing Honda CRF450X. Leading the overall motorcycle and Class 21 (250cc two-stroke or 450cc four-stroke) standings after one 2009 SCORE Baja race is the two-time defending season class point championship team of Carlos Casas/Noe Ibarra, Chula Vista, Calif., with 69 points on another Honda CRF450X. The defending Class 25 open ATV championship team led by rider of record Wayne Matlock, El Cajon, Calif., on a Honda TRX700XX has 69 points and now has won four straight SCORE Baja races. Riding with Matlock to victory in San Felipe were Harold Goodman and Josh Caster. Leading the overall ATV and the Class 24 point standings with 72 points is the team led by defending Class 24 season point champion Craig Christy, Burbank, Calif., on a Honda TRX450R. Among the other motorcycle class point leaders are Jim O’Neal, Simi Valley, Calif. (Class 50, Honda CRF450X), Mike Johnson, El Paso, Texas (Class 30, Honda CRF450X), Brian Campbell, Bakersfield, Calif. (Class 40, KTM 450XCF) and Hector Castillo, Calexico, Calif. (Class 20, Yamaha WR250). For more information regarding the series, contact SCORE at its Los Angeles headquarters 818.225.8402 or visit the official website of the 2009 SCORE Desert Series at www.score-international.com. SCORE TROPHY-TRUCK—1. Robby Gordon, Charlotte, N.C., Chevy CK1500 (1), 125; 2. Mark Post, Laguna Beach, Calif./Rob MacCachren, Las Vegas, Ford F-150, 104; 3. Adam Householder, Orange, Calif., Chevy Silverado, 103; 4. Ed Stout, Santa Ana, Calif., Chevy Silverado, 101; 5. Greg Nunley, Tulare, Calif., Chevy Silverado, 96; 6. 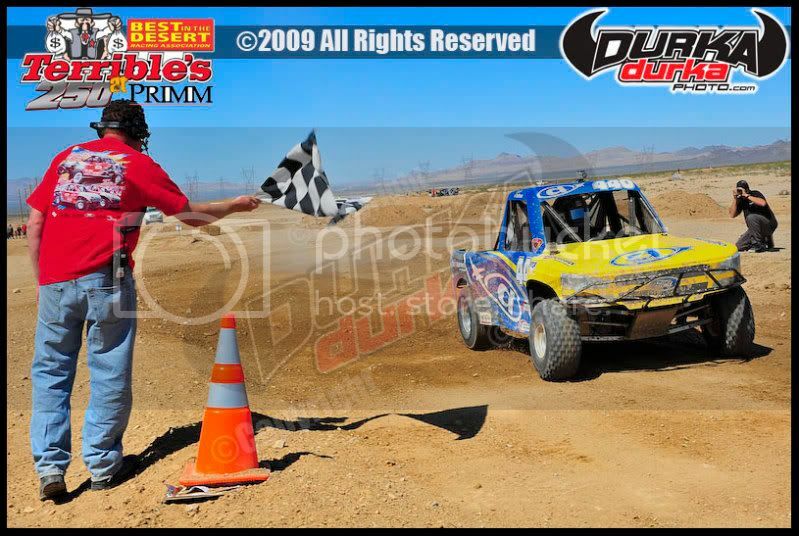 Brian Collins, Las Vegas, Dodge Ram 1500 (1), 95; 7. B.J. Baldwin, Las Vegas, Chevy Silverado, 81; 8. 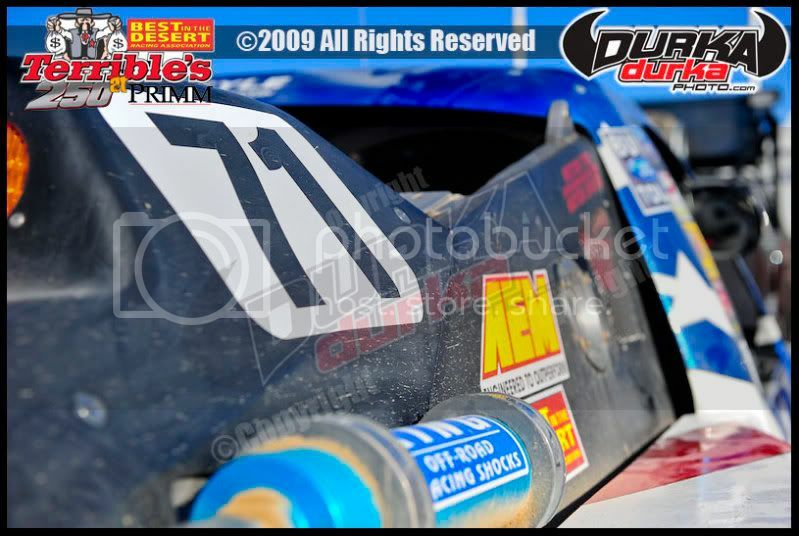 Robbie Pierce, Santee, Calif., Chevy Silverado, 71; 9. Cameron Steele, San Clemente, Calif., Chevy Silverado, 68; 10. (TIE) Roger Norman, Reno, Nev./Larry Roeseler, Huntington Beach, Calif., Ford F-150 and Chet Huffman, Northridge, Calif./Jerry Whelchel, Portola Hills, Calif., Chevy CK1500, 64. CLASS 1—1. Ronny Wilson, Long Beach, Calif., Jimco-Chevy (1), 116; 2. Randy Wilson, Lakewood, Calif., Jimco-Chevy, 103; 3. Julio Herrera, Cabo San Lucas, Mexico, Jefferies-Chevy, 100; 4. Dale Lenk, Newport Beach, Calif., Penhall-Chevy, 94; 5. 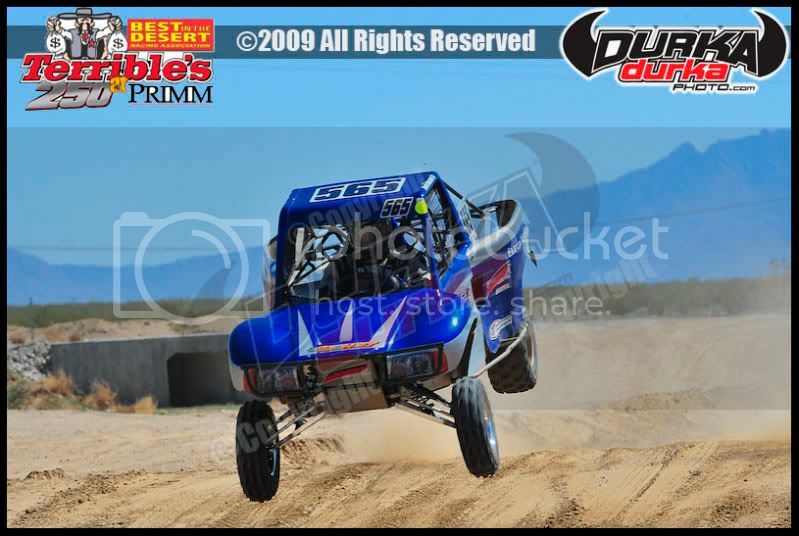 Richard Boyle, Ridgecrest, Calif., Jimco-Chevy, 93; 6. Armin Schwarz, Germany, Jimco-BMW, 81; 7. Josh Rigsby, Santa Fe, N.M., Jimco-Chevy, 70; 8. Harley Letner, Orange, Calif., Alpha-Chevy, 69. CLASS 1-2/1600—1. (TIE) 1. Justin Smith, Capistrano Beach, Calif., Fraley-VW (1) and Brian Wilson, Long Beach, Calif./Sammy Ehrenberg, Las Vegas, Kreger-VW, 114 ; 3. 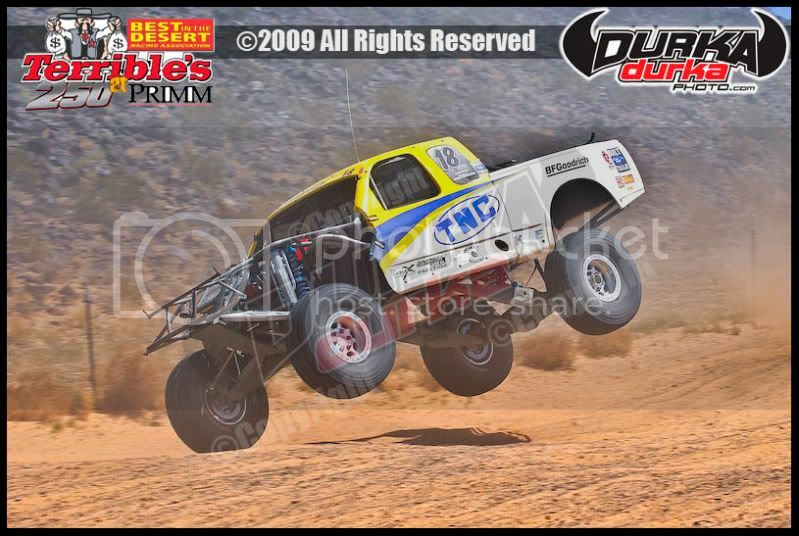 Eric Duran, Tecate, Calif., Neth-VW, 105; 4. Mario Gastelum, El Centro, Calif., Curry-VW, 104; 5. Dave Caspino, Woodland Hills, Calif., Lothringer-VW, 100. ALSO: 8. Adam Pfankuch, Carlsbad, Calif./Steven Eugenio, El Centro, Calif., Mirage-VW (1), 75. CLASS 3—1. Donald Moss, Sacramento, Calif., Ford Bronco (2), 105. CLASS 5—1. Kevin Carr, San Diego, VW Baja Bug (2), 105. CLASS 5/1600—1. Alonso Angulo, Ensenada, Mexico (1), 92. CLASS 6—1. Heidi Steele, San Clemente, Calif./Ross Savage, Huntington Beach, Calif., Ford Ranger (1), 95; 2. 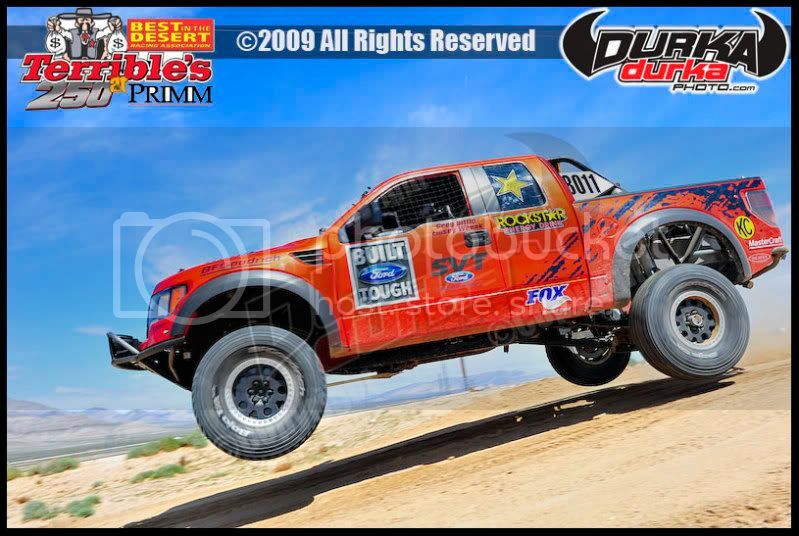 Marc Burnett, Chula Vista, Calif., Ford Ranger (1), 65. CLASS 7—1. 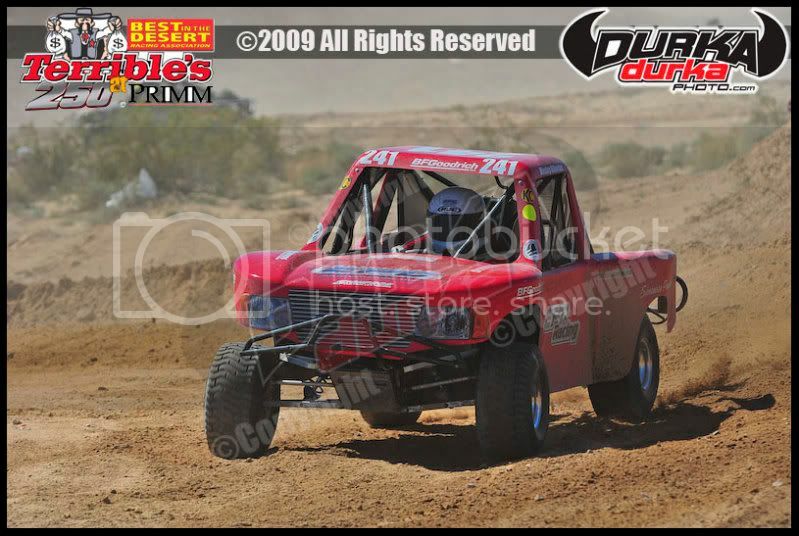 Jose Canchola Jr., Mexicali, Mexico, Ford Ranger (1), 102; 2. 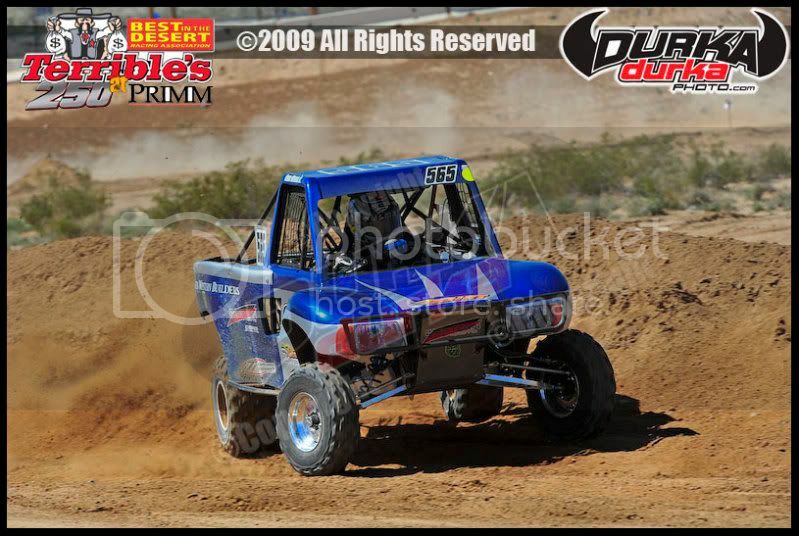 Dan Chamlee, Carpenteria, Calif., Ford Ranger (1), 98; 3. Heidi Steele/Rene Brugger, San Clemente, Calif., Ford Ranger, 85. CLASS 7SX—1. 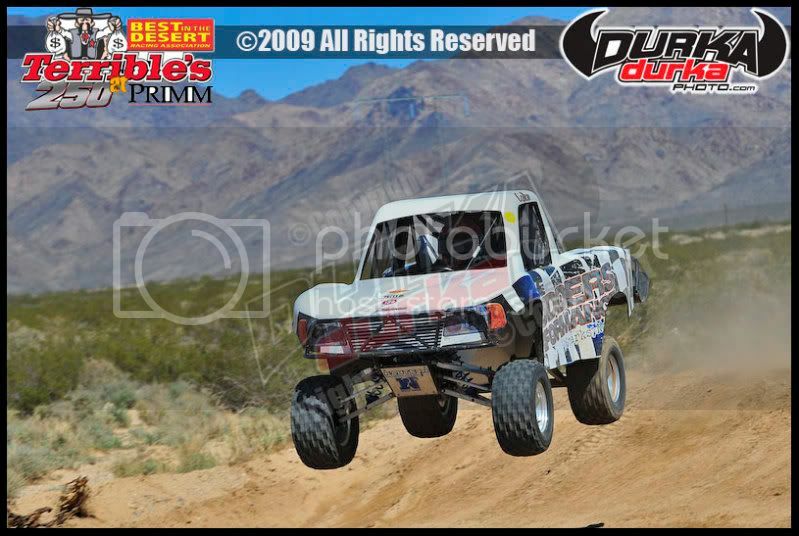 John Holmes, Olivenhain, Calif., Ford Ranger (1), 95; 2. Norman Turley, Long Beach, Calif., Ford Ranger, 65. CLASS 8—1. Clyde Stacy, Bristol, Va., Chevy Silverado, 93; 2. Dave Crinklaw, Reedley, Calif., Ford F-150 (1), 65. CLASS 9—1. Daniel Reyes Jr., Calexico, Calif., Venegas-VW (1), 65. CLASS 10—1. Mike Lawrence, Sunset Beach, Calif., Lothringer-VW (1), 107; 2. 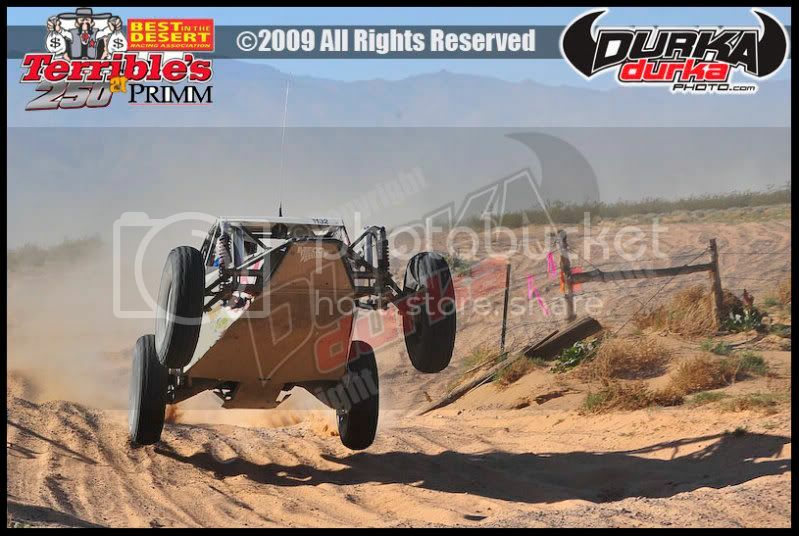 Scott Gailey/Scott Whipple, Norco, Calif., GET-VW, 93; 3. Tito Robles/Lobsam Yee, Tijuana, Mexico, Jimco-Honda (1), 64. SCORE LITE—1. Rick St. John, Encinitas, Calif./Adam Pfankuch, Carlsbad, Calif., Duvel-VW (2), 110; 2. Brent Parkhouse, Long Beach, Calif./Chuck Sacks, Canyon Lake, Calif., Moulton, 94; 3. 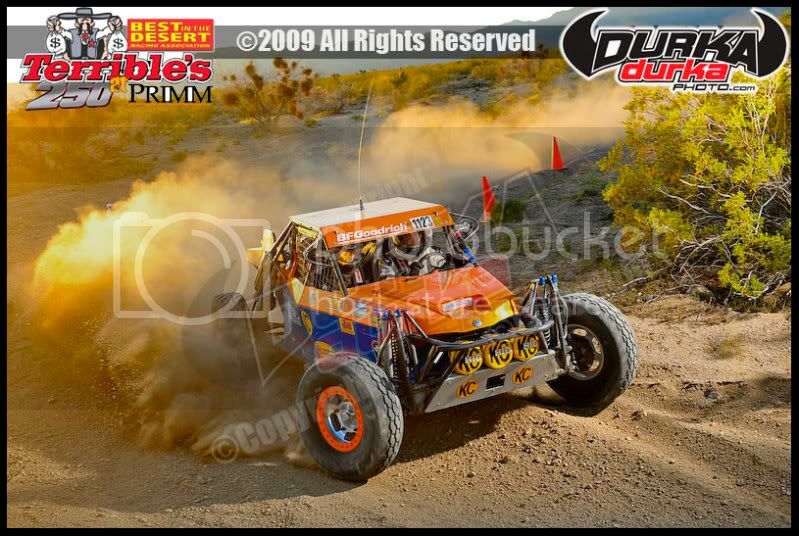 Michelle Bruckmann/Vic Bruckmann, Lemon Grove, Calif., Lothringer-VW, 59, 4. Lee Banning, Laveen, Ariz., Foddrill-VW, 57. STOCK MINI—1. 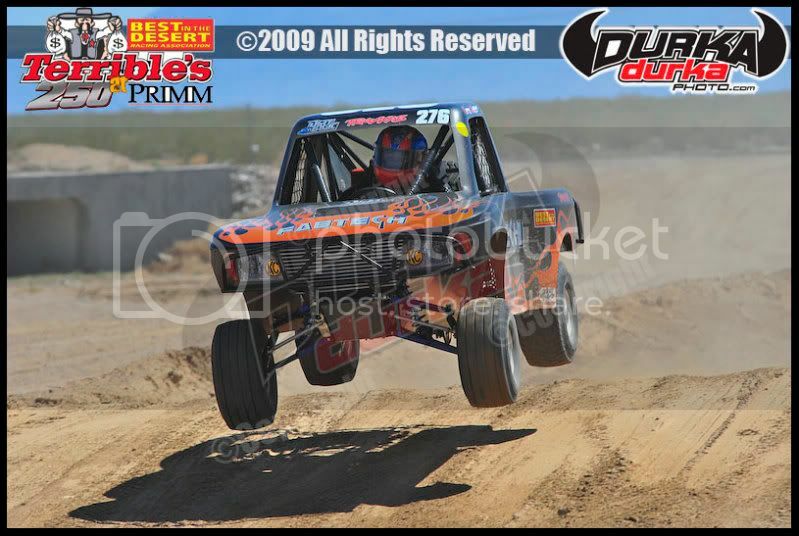 Gavin Skilton, Anaheim, Calif., Honda Ridgeline (2), 105. CLASS 11—1. Eric Solorzano, Tijuana, Mexico, VW Sedan (1), 65. STOCK FULL—1. Justin Matney, Bristol, Tenn., Dodge Ram1500, 60. CLASS 22—1. Kendall Norman, Santa Barbara, Calif./Timmy Weigand, Santa Clarita, Calif., Honda CRF450X (1), 68; 2. Colton Udall, San Clemente, Calif./Quinn Cody, Los Olivos, Calif./Jeff Kargola, San Clemente, Calif., Honda CRF450X, 62; 3. Ivan Ramirez, Ensenada, Mexico/Brent Harden, Menifee, Calif./Jose Villalobos, Tecate, Mexico, Honda CRF450X, 58; 4. Cameron Corfman, El Centro, Calif./Jimmy Lopez, El Cajon, Calif./A.J. Stewart, Jamul, Calif., Beta RR525, 55; 5. Adam Thissen, Reno, Nev./Robert Underwood, Coleville, Calif., KTM XC505,53. CLASS 21—1. Carlos Casas/Noe Ibarra, Chula Vista, Calif., Honda CRF450X (1), 69; 2. Ronnie Wilson, Glendale, Calif., Honda CRF450X, 63; 3. Jeremy Purvines/Ron Purvines, Henderson, Nev./Scott Glimp, Las Vegas, Honda CRF450X, 59. CLASS 20—1. Hector Castillo, Calexico, Calif./Rene Pojodes, Mexicali, Mexico/David Gonzalez Jr., Chula Vista, Calif., Yamaha WR250 (1), 65; 2. Anna Cody, Simi Valley, Calif./Talya Dodson, Truckee, Calif./Cathy Duncan, Los Alamos, Honda CRF250X, 59; 3. Jesus Rios/Cuauhtemoc Beltran, Calexico, Calif./Edgar Espinoza, El Centro, Calif., Honda CRF250X, 55. CLASS 30—1. Mike Johnson, El Paso, Texas/Rex Cameron, Albuquerque, N.M., Honda CRF450X (1), 67; 2. Jim O’Neal, Simi Valley, Calif./Tom Willis, Las Vegas/Derrick Paiement, Corona, Calif./Brian Sweany II, Lancaster, Calif., Honda CRF450X, 61; 3. Sean Bradley, Ridgecrest, Calif./Kyle Abney, Albuquerque, N.M., Kawasaki KX500, 57. CLASS 40—1. Brian Campbell/Bill Cotton, Bakersfield, Calif./Pete Cochran, Laguna Beach, Calif., KTM 450XCF (1), 66; 2. Scott Myers, Menifee, Calif./Brett Helm, Poway, Calif./Lou Franco, Sherman Oaks, Calif.,/Jeff Kaplan, Thousand Oaks, Calif./Tim Withers, Pepeekeo, Hawaii, Honda CRF450X, 60; 3. Julio Abril/Oscar Hale/Mario Acosta, Ensenada, Mexico, Yamaha WR450, 56. CLASS 50—1. Jim O’Neal, Simi Valley, Calif./Andy Kirker, Santa Ana, Calif./Dan Dawson, Agua Dulce, Calif./Tim Withers, Pepeekeo, Hawaii, Honda CRF450X (1), 65; 2. Charlie Marshall, Carmichael, Calif./Doug Smith, Upland, Calif./Dave Potts, Burbank, Calif./Chuck Sun, Las Vegas, KTM530XCW, 59. CLASS 60—1. Ramon Isuarieta/Luis Zarate/Luis Farell/Manuel Cardona, Mexico City, Mexico, Honda CRF450X (1), 65. CLASS 25—1. Wayne Matlock, El Cajon, Calif./Harold Goodman Jr., Brownstown, Mich./Josh Caster, El Cajon, Calif., Honda 700XX (1),69; 2. Felipe Velez, San Felipe, Mexico/Stefano Caputo, San Felipe, Mexico (Italy)/Heriberto Marquez, Ensenada, Mexico, Honda TRX450R, 63; 3. Santos Perez, Tijuana, Mexico/Juan Sanchez/Raul Cano, Chula Vista, Calif., KTM 450, 59. CLASS 24—1. Craig Christy, Burbank, Calif./Steve Abrego, Covina, Calif./Dave Scott, Belen, N.M./Andy Lagzdins, Baltimore, Honda TRX450R (1), 72; 2. Victor Lopez/Jorge Lopez, San Felipe, Mexico/Gonzalo Curiel, Ensenada, Mexico, Honda TRX450R, 66; 3. Miguel Arellano/Adan Arellano/Bernardo Arellano, Tijuana, Mexico, Suzuki LTR450, 62. CLASS 26—1. Reid Rutherford, Montrose, Colo./ Benn Vornadakis, Rico, Colo./Tony Valerio, Telluride, Colo., Arctic Cat (1), 65; 2. Rob Ransford, Downers Grove, Ill./Tim Winiarski, Carson, Calif./Joe Rice, Lomita, Calif., Can Am Renegade, 59. SPT TRUCK—1. 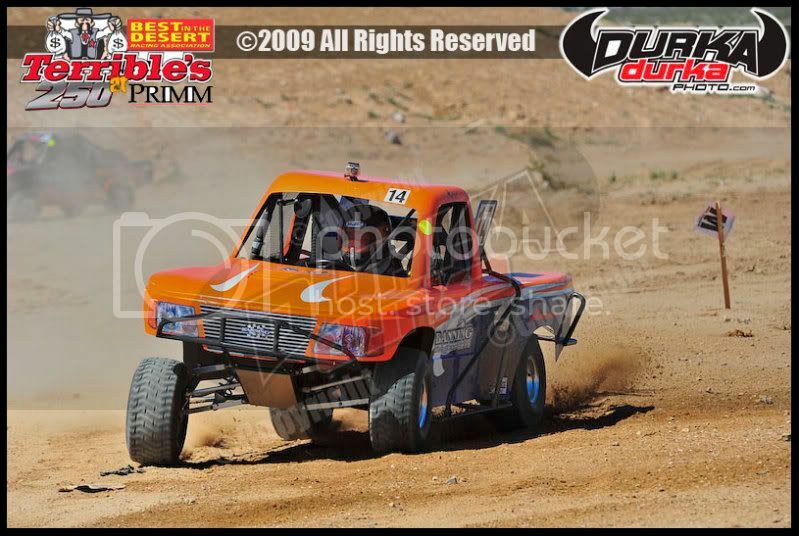 Nick Tonelli, Huntington Beach, Calif., Ford Ranger, 65. SPT CAR—1. Peter Lang/Terry Cottar, Santa Rosa, Calif., Homebuilt-Chevy, (1), 80. SPT UTV—1. Brian Hewett, Los Altos Hills, Calif., Yamaha Rhino, 35. SPT M/C>250cc—1. Jeff Leonard, Bakersfield, Calif./Eugene Lane, Redondo Beach, Calif./Jack Cox, Oceanside, Calif., Honda CRF450X (1), 71. SPT M/C<250cc—1. Humberto Valle, Tecate, Mexico/Javier Ochoa/Ivanhoe Ochoa, Tecate, Calif., Honda CRF450X (1), 73. SPT ATV—1. Manuel Jimenez/Carlos Lopez/Carlos Castaneda, San Felipe, Mexico, Honda TRX450R (1), 75. Engine Builder—1. Major Performance, 125; 2. FAT Performance, 106; 3. Wiks, 86; 4. Menards, 50; 5. Montes, 45. Original Buggy Chassis—1. Jimco, 91; 2. Lothringer, 44; 3. Duvel, 35; 4. Fraley, 30; 5.Bunderson, 29. Denver, CO - April 13th, 2009. 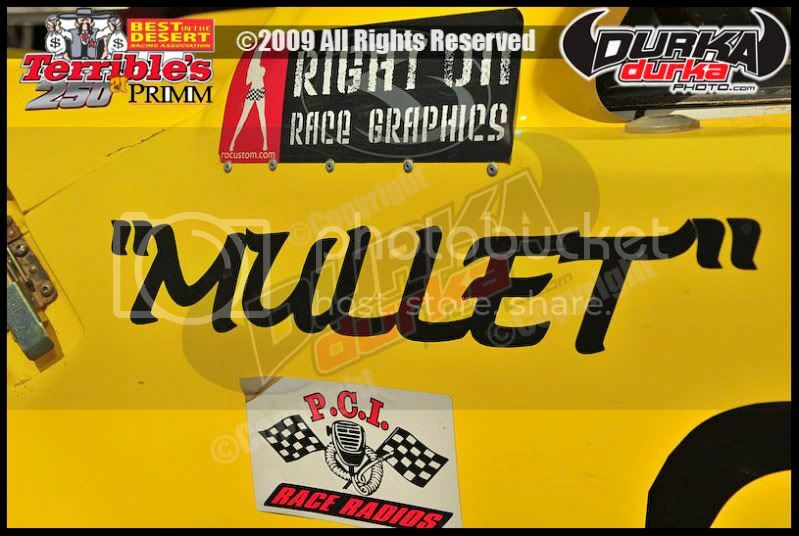 Miller Motorsports Park and Race Central TV & Radio, the premier home for all forms of motorsports are proud to announce special ticket packages and pricing for the first two events of 2009 at Miller Motorsports Park in Tooele, Utah. These special ticket packages and pricing are available to all Race Central TV and Radio fans by calling (435) 277-RACE for these events. This special offer applies to the American Le Mans Series race in mid-May and theHANNspree FIM Superbike World Championship Event at the end of May. Miller Motorsports Park features and guests will be a regular part of the Race Central programming during the 2009 season. "This is a fantastic opportunity for race fans around the Country to experience first hand what is maybe the finest Motorsports Complex in North America and at fantastic special ticket and ticket package pricing for these first two Events of 2009" says Kurt Hansen, COO of Motorsports Media Inc.
Miller Motorsports Park is a state-of-the-art road racing facility located 30 minutes from Salt Lake International Airport in Tooele, UT. The 511-acre facility, designed by renowned track designer Alan Wilson, includes a multi-configurational 4.5-mile road racing track, a 0.9-mile multi-configurational karting track and a seven-acre Off-Road Course. Miller Motorsports Park is home to the Miller Performance Training Center, which offers a variety of driving programs including the Ford Racing High Performance Driving School. Miller Motorsports Park hosts many of the world's top professional road racing championships including the FIM HAN spree Superbike World Championship, the American Le Mans Series, the Rolex Grand-Am Sports Car Series, AMA Pro Road Racing and the NASCAR Camping World Series West, as well as numerous local, regional and national amateur automobile and motorcycle racing series. 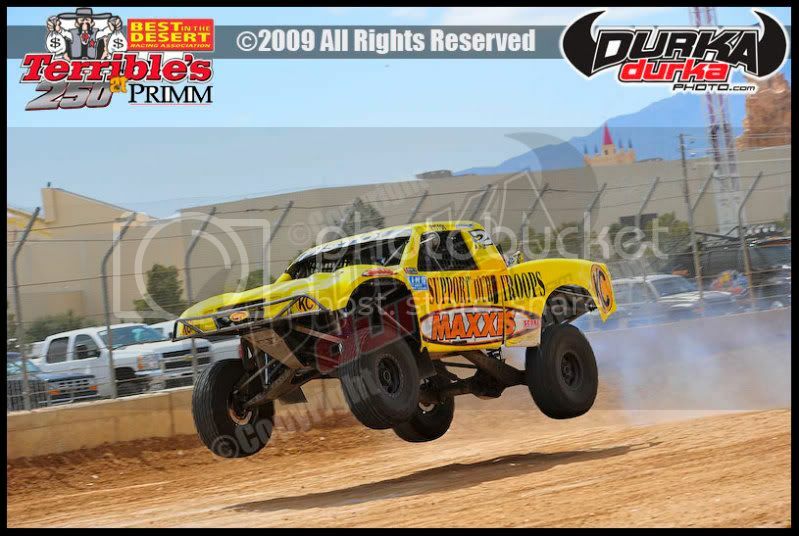 For more information, call 435-277-RACE (7223) or visit www.MillerMotorsportsPark.com. After years of desert racing and earning a Best in the Desert Class 1000 championship, Matt Loiodice was ready to try his hand at short course racing in his #20 MasterCraft Unlimited Lite at the season opener of the Lucas Oil Off Road Racing Series held April 4-5, 2009 at the Primm Valley Motorsports Complex. The highly anticipated inaugural race of the 2009 Lucas Oil Off Road Racing Series kicked off to a nearly sold-out crowd, despite extreme weather and strong winds that forced the cancellation of the second half of Friday's practice. Debuting in the #20 Unlimited Lite built by famed chassis builder, Jimco Racing, Matt Loiodice remarked, "This is my first short course race and it is much different than desert racing! In a six hour desert race you can make a few mistakes and still overcome them for a win. In short course racing, you only have a half hour and 15 laps. One mistake can take you from the lead to last real quick." Taking the green flag in the 18th position during round one on Saturday, Loiodice charged through the field and earned a 9th place finish, despite a spin-out in turn two. After the race, Matt commented, "I would have liked to have a little more seat time on a short course track. We tested last weekend for a few hours in Surprise, but nothing can really prepare you for the first race. All in all, I am happy with the finish." Qualifying in the 9th position for Sunday's round two, Loiodice was running strong until the transmission locked up causing the #20 to go two laps down. Finishing the race in second gear, Matt was able to pull off a 13th place finish despite the transmission failure. 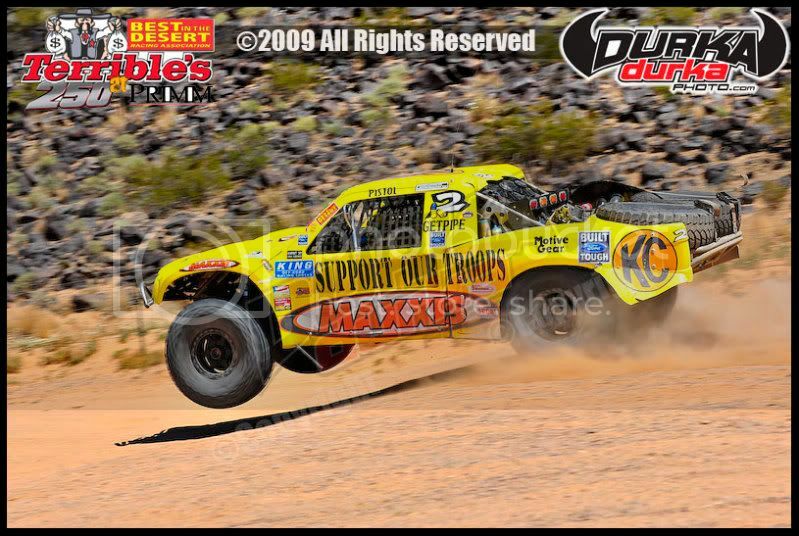 Look for Matt Loiodice in the #20 Jimco-built Unlimited Lite at the second race of the 2009 Lucas Oil Off Road Racing series held May 2 - 3, 2009 at Speedworld Off Road Park in Surprise, AZ. 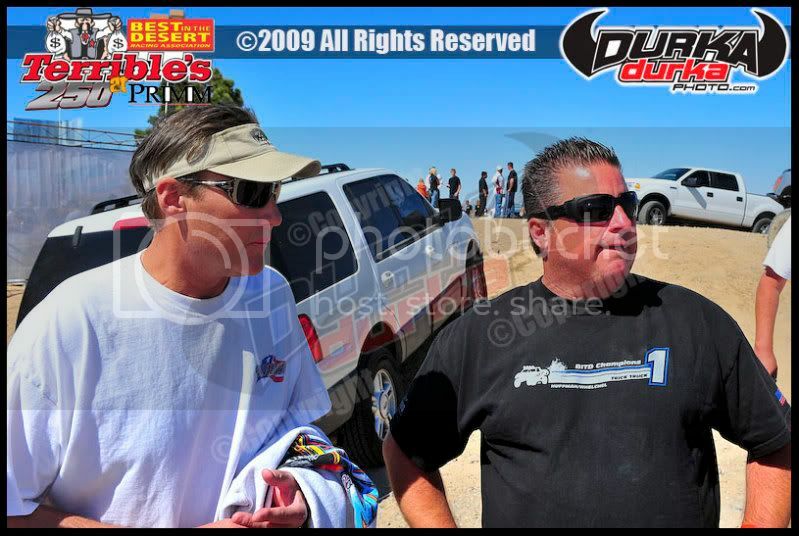 Corona, California (April 10, 2009) - Today the Lucas Oil Off Road Racing Series (LOORRS) announced a partnership with Spanish Language Station KWHY-TV. This agreement will add an additional 39 hours of the Lucas short course series on Spanish language television. Available both on broadcast and cable television, KHWY reaches over 50 million households in Southern California including the San Diego, Orange, Los Angeles, San Bernardino, and Riverside Counties. 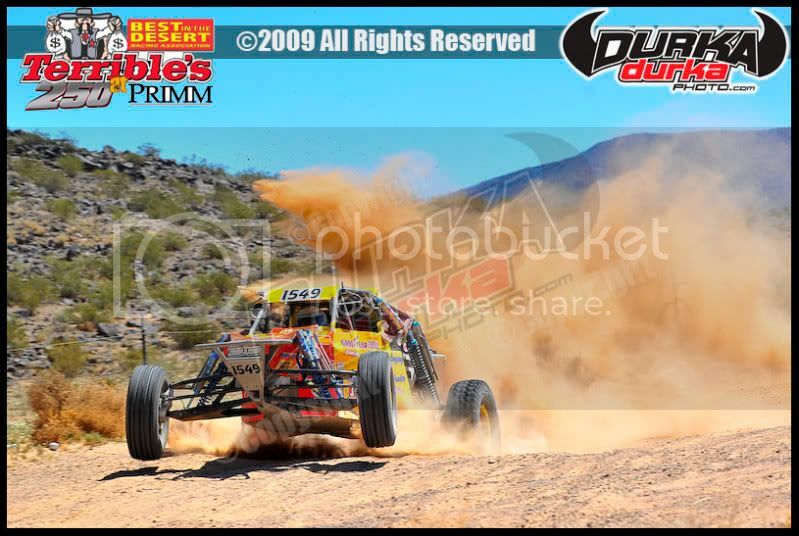 This additional television coverage will allow the popular Lucas Oil Off Road Racing Series to be broadcast from June through December 2009. Said Lucas Oil's Bob Patison on the agreement," Reaching the emerging Hispanic marketplace is extremely important to the series and Lucas Oil. We know of the love for Baja desert racing and we believe that we will be able to capture that same excitement and enthusiasm with short course off road racing. It is a fantastic opportunity to enter into this partnership with KWHY." This additional television coverage is added to the already confirmed fifty four hours of television coverage for the Lucas Oil Off Road Racing Series that will be seen on NBC, SPEED, The Outdoor Channel, Versus (Vs) and MavTV. KWHY is a television station in Los Angeles, CA that serves the Los Angeles television market. The station runs Spanish programming. KWHY is a full-power television station that operates with 2630 kilowatts of power and is owned by NBC Universal. This station broadcast primarily in Spanish. 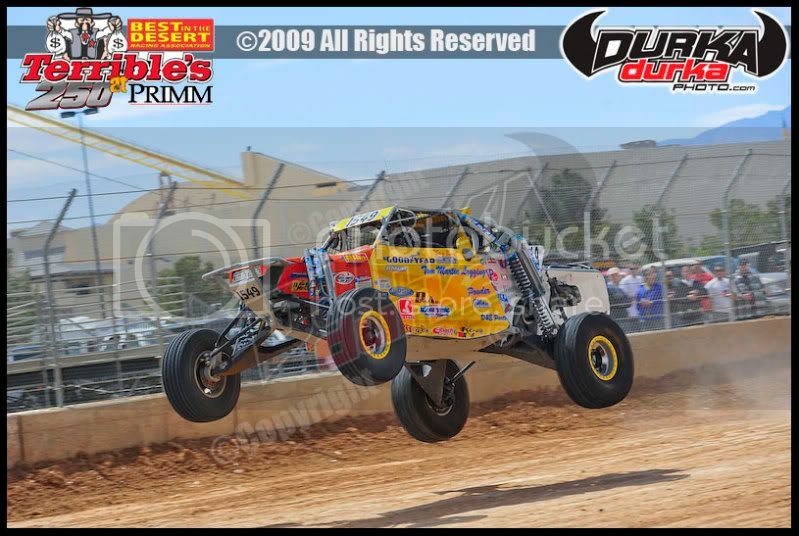 The Lucas Oil Off Road Racing Series (LOORRS) is the evolution of the long standing support of short course racing by Forrest Lucas and Lucas Oil. Steeped in the Midwest tradition of short course off road racing infused with a West Coast influence, LOORRS brings intense four wheel door to door action to challenging, fan friendly tracks. Lucas Oil Off Road Racing Series: This is Short Course. For more information please visit www.LucasOilOffRoad.com. Crandon, WI (April 10, 2009)- The Traxxas TORC series is proud to announce that NASCAR Driver and Off Road Champion Robby Gordon will be racing select TORC series races in 2009. 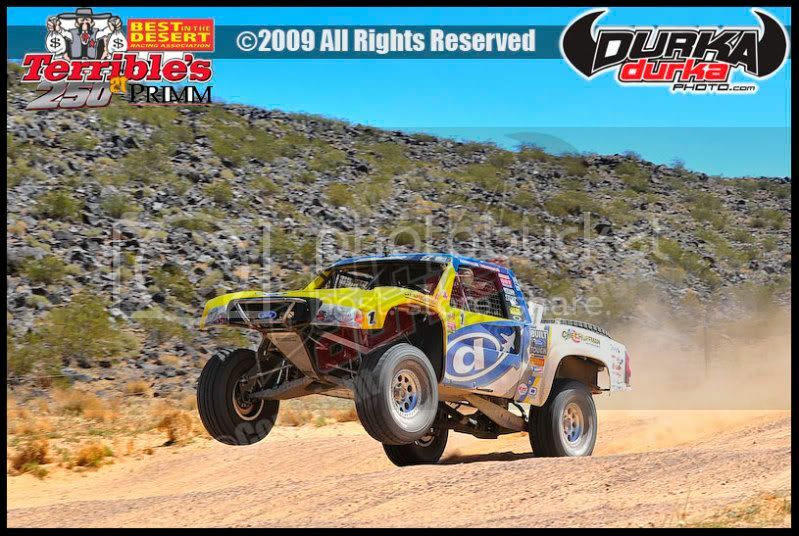 Gordon, fresh off his 3rd place finish overall in the 2009 DAKAR Rally, will take the Short Course arena by storm behind the wheel of his PRO 2WD Chevy. "Ricky [Johnson] has done an outstanding job putting together such a talented and dedicated group of drivers and sponsors to help create this racing series. We will field our PRO 2WD Chevy in as many races as my schedule permits this season. I see TORC as the next generation in short course off road racing competition for both racers and the fans, and I am excited to be a part of it,” commented Robby Gordon on the TORC Series. The Traxxas TORC Series- The Off Road Championship, presented by AMSOIL is the world’s premier off road series, bringing together the best of Midwest short course off-road racing with exciting new Western State venues. TORC allows drivers to push the limits with action-packed, fender-pounding racing competition on challenging natural terrain racetracks. The season kicks off May 15, 2009 at Texas Motor Speedway. 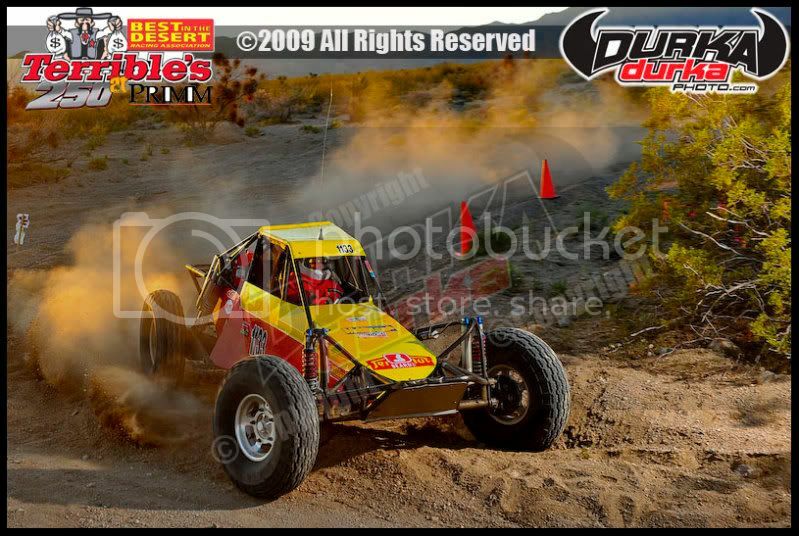 For more information on TORC, please visit www.torcseries.com.